Chablis beckoned. The previous three years I had concentrated on the CÃ´te d'Or (with a slight straying south into the Couchois). Chablis is about two and a half hours' drive from Beaune, and, although part of Burgundy, quite a separate district. Sales of the wines we import from the CÃ´te d'Or have gone so well that I thought it was now time to go and investigate. It is possible to meet dull Chablis in this country, and the climate is so marginal that the weather often makes life difficult for the growers, so it seemed like a good challenge to see if I could find any interesting, exciting wine. In the event, it was an eye-opener: at the domaines I visited I liked all the Chablis I tasted - they were clean, well made and interesting. Eating out in the region I will admit that I met one or two disappointing bottles. So I'm doing better - a much higher success rate with hotels, and each morning I have learnt to get dressed like a skier, building up the layers of clothing so as to stay warm. I spent the Monday and Tuesday in and around Chablis, and the rest of the week (3 days) in the CÃ´te d'Or, mostly visiting growers with whom I am already doing business, though I did see a few new people and bought from one. I arrived in darkness at my hotel a few kilometres north of Chablis on Sunday evening. DOMAINE SYLVAIN MOSNIER. I meet M.Mosnier at his cellars, which are on the main road. He is quite a burly fellow with a rolling gait (Clive Coates describes him as "jolly"). He has a round face framed by a beard - his expression rather puts me in mind of a garden gnome. Across the road from the cellars the vineyards stretch away uphill. To go down into the cellar you have to step over a little protective wall outside, necessary because the run-off of water from the hillside would otherwise flood the cellar. We enter. It's warmer here than outside. He tells me that he's only got his straight Chablis to sell - he makes some Premier Cru, but not a lot and it's all spoken for. We taste through four vintages, 98 back to 95, two bottlings, the ordinary cuvÃ©e and Vieilles Vignes. These are all exciting wines - clean with good acidity. Above all I like the 1998 ordinary cuvÃ©e. My second visit of the morning was to a doleful, bronchitic domaine owner, who smoked Gauloises and rambled on to me at great length about wine and things. The wine here was perfectly well made, though I liked other domaines' Chablis better. However, he did hand me the card of a grower in Ã‰pineuil, who he said made good red wine - a M.Leger, whose wine is delicious (see below). DOMAINE DENIS POMMIER (Poinchy). Poinchy is a small village between Beines and Chablis. Denis Pommier and his wife are young, and very much a team. She speaks good English, and he is a thoughtful wine maker, interested in all aspects of the process, including the question of oak barrels. Interestingly, I got the strong impression that the debate over oak (or not) is still very much a live issue around Chablis, with wine makers taking great care in many cases to ensure that the oak influence on the taste of the wine should be so subtle as to be undetectable. We start tasting: all wines from the 98 vintage, starting with his Petit Chablis, which is absolutely delicious - very fruity, and lots of acidity which stays tingling on the tongue. Then his Chablis, which is less expressive at this stage, though it still has plenty of attractive fruit with a fine floral dimension to the flavour - a feature of all Pommiers's wines. Then on to his three Premiers Crus -Fourchaume, Beauroy and CÃ´te de Lechet. I particularly like the Beauroy, which shows the oak influence much more strongly than the other two, especially on the nose (in the mouth it appears to me beautifully balanced). M.Pommier says the oak smell will settle down in time and be less assertive. When I return a week later to collect the wines, M.Pommier treats me to a barrel tasting of the 99 vintage while his wife goes off to the RÃ©gie (Customs) to sort out the documentation. We taste his Beauroy from barrels made by three different coopers - FranÃ§ois FrÃ¨res of St. Romain, another cooper, Gillet, also based in St. Romain, and Seguin Moreau. This is fascinating, with the FranÃ§ois barrel giving the most obvious oaky flavour, while the Seguin Moreau and Gillet barrels are remarkably similar. Seguin Moreau is much the most expensive. Gillet is the least expensive. If I were a wine maker I'd be keen to do business with Gillet. DOMAINE JEAN-MARIE NAULIN (Beines). Back to Beines. Mme.Naulin, who deals with customers and does the talking, greets me. No sign of M.Naulin. She is charming and smiling and has an air of wonderment and eagerness about her which is delightful. She is sort of small and round, though not fat. She lets me into the yard of what turns out to be her in-laws' house, though nobody seems to live there. M.Naulin appears. He is even smaller than his wife, barely five foot tall, very neat and nattily dressed in a leather jacket, sludge green shirt and yellow tie. He doesn't say much, but seems friendly enough. Mme.Naulin chattily takes me down into a cellar underneath the kitchen to taste. M.Naulin accompanies us wordlessly. The first bottle she opens is a straight 98 Chablis. It has a marvellous green Chablis colour. Unexpressive at first on the nose, after a few minutes it opens up. This is fine Chablis with good fruit and acidity. We then taste two vintages of their Premier Cru Beauroy - 98 and 97. The 98 is, I think, much nicer. It has more weight and more length than the straight Chablis, with a lovely finish. All these wines are unoaked. This domaine extends to 13 hectares, with about 10 hectares of plain Chablis and 3 of Premier Cru. Nearly all the domaines I visited had holdings of between 10 and 15 hectares, a little larger than the growers I buy from on the CÃ´te d'Or. DOMAINE LEGER (Ã‰pineuil). I visit this domaine in the afternoon. I have been given directions to get to it: go past the church, and follow the road right to the very end and it's on the right. I go past the church, and follow the road. The houses of the town of Ã‰pineuil give way to the odd building plot, broken down farm buildings, and then open farmland, with the road having turned into a chalky track. Still nothing that looks remotely like a winery. I press on, not very hopefully, down the track. The final set of buildings, away to the right, is a collection of corrugated iron sheds. They look like nondescript farm buildings. There is no sign or anything. But it is at the end of the road, so I drive up to the sheds. It is the Domaine Leger! I am met by the son, who is large and young, with spectacles set not quite straight on his nose. You could picture him with a school cap on, like Billy Bunter. He shows me into what I suppose is the office, which reminds me of a back street car mechanic's, with oil drums and dirty rags about the place. No sign of any bottles, or cellars or anything. At the far end is a door leading into a room that seems to be small enough to be a cupboard. M.Leger goes into it and reappears with a pair of bottles - one red and one rosÃ©. He opens the red. There is a tray with a few cheap, small wine glasses, not tasting glasses, on the counter. He picks one up, looks at it, gives it a wipe. He pours me some wine. I sniff at it - not that easy to smell with this sort of glass - and try a taste. It is delicious: a touch of tannin, pure Pinot Noir flavour, ripe sweet fruit, with a really good finish. What a surprise. I try the rosÃ©. It is pale, so pale as to be barely rosÃ©. It is not as interesting as the red. Collecting the wine the following week, I have to go with M.Leger down to the RÃ©gie (Customs) in Tonnerre - Ã‰pineuil is really a suburb of Tonnerre. It turns out to be a small shop on a corner in the centre of town selling cigarettes, lighters, leather goods and suchlike. The young woman behind the counter keeps moving about as if she has a transistor radio inside her head. She has to make a telephone call to find out what she's meant to do with the documentation that M.Leger has brought in. It is all stamped up, and off we go back to the domaine. I pay M.Leger, and he puts a pair of cases of wine on to one of those two-wheel trolleys that railway porters used to use, and gets hold of the handles to take the wine out to my car. He doesn't hold on to the cases, and they topple. Crash. Sound of breaking glass. One of the boxes begins to bleed red wine. He picks it up, puts it out in the rain and gets another case. He seems utterly unruffled by this little accident. I visited one more domaine before going back to the hotel for supper. I had seen eight growers - a busy Monday. DOMAINE HEIMBOURGER (Saint Cyr Les Colons). Slightly further out into the sticks, towards Irancy. The son, Olivier, who is in his twenties, has taken over from his father. He strikes me as being thoughtful and intelligent, with a real fascination for the process of wine making. He thinks it might be an idea for him to show me his vines. We jump into his van and motor off through the fog. We reach a vantage point at the top of a hillside to view the vines. Visibility is about 20 metres. Never mind, we tried. He then takes me to a wonderful collection of stone barns. We enter one, and it is full of large upright tanks containing wine. We taste - Bourgogne Chardonnay, Chablis. He is meticulous in his cleanliness, always wiping and washing down if necessary. Underneath these tanks is a cellar! Imagine - a farm building with a cellar. Are the French civilised or what! This is a barrel cellar where he keeps his Pinot Noir, and some Chablis. We taste from the cask. Fascinating, and impressive. These wines taste delicious. Then back to his parents' house, and into another old stone building, which inside has been kitted out with an immaculate stone floor, wooden counter and tiny modern spotlights strung up on wires. They must have spent some money on this. We taste from bottle, starting with his 97 Bourgogne Chardonnay. This is delicious: fruity, with a good smell, a really lively taste, and a nice minerally finish. Then his 98 Bourgogne Chardonnay - a bit less fruity, more minerally, and more length. A pair of Chablis from the 98 vintage: unoaked (his regular bottling) and oaked. They are both fine, but the oaked one is specially yummy. On to his reds - a very pleasant, fruity, gluggable Passetoutgrain, a really delicious Bourgogne Pinot Noir, and a somewhat lighter Irancy from young vines (he has only just bought the land and planted vines). When I collect my order, Olivier gives me a bottle of an experimental wine he has made - a Vendange Tardive with an alcoholic content of 14%. He said leave it for 6 months before drinking it. I can barely wait. I then visited some domaines in and around Irancy, but ended up buying nothing. The wines are fine, but not that cheap and they need a bit of ageing, so at this stage might be rather difficult to sell, though I hope eventually to return one of the growers I saw, whose wines impressed me. DOMAINE Ã‰LISE VILLIERS (PrÃ©cy-le-Moult). I had a bit of trouble finding this domaine. It is an hour's drive from Chablis, and is separated from its own vineyards by about five miles, out in the countryside, with no vines in sight. It has 3 hectares of vines (approximately 8 acres), mostly Chardonnay, but some Pinot Noir. Mme.Villiers is, I suppose, about my age, and like a little bird. She flits about, and eyes you. She collected a couple of bottles from the barn, and took me into the house. We sat opposite each other at an enormous long wooden table in a room with a large open fireplace. At the far end of the room, by a window, sat an old lady minding her own business. As we made our way to the table Mme.Villiers asked me: "Vous cherchez du chardonnay, Monsieur?" I said I was just looking for good wine. She proceeded to open the pair of bottles. I said didn't she have some Pinot Noir? She did, she said, but it was all sold. The two bottles are both Bourgogne VÃ©zelay from the 1998 vintage, one "La ChevaliÃ¨re" unoaked, the other "Le Clos" matured in demi-muid, large casks double the size of the usual burgundian barrel. I taste "La ChevaliÃ¨re" first. It is wonderful. I sit and enjoy the extraordinarily beautiful flavour that lingers in the mouth. Mme.Villiers eyes me, head cocked slightly to one side: "You don't like it?" "It is very good wine," I say. I try "Le Clos". This is considerably tighter and less easy to taste than "La ChevaliÃ¨re". Mme.Villiers explains that it has been fairly recently bottled and is consequently less expressive than the first wine. I know I want to buy some of Mme.Villiers' wine. I ask if she would be prepared to deliver the wine, say, to Chablis so that I could make up a groupage with other growers' wines. She thinks that would be possible. 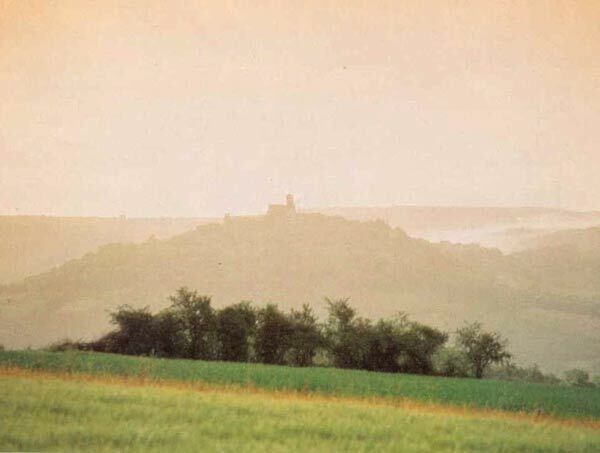 A week later, as I collect my order, Mme.Villiers asks me to tell her what "les anglais" think of the wine of VÃ©zelay. That night I stayed in Chablis, in the best hotel I have ever been in: great food, a beautifully decorated and furnished room, and genuinely helpful and personal service from all the staff. Finally, I did also go to the CÃ´te d'Or, but time constraints have forced me to stop here. I hope to complete that part of my account soon.